In last week’s post, we talked about the importance of having a bigger vision to work toward. But I believe that only having that vision isn’t enough. You also need to identify the small, consistent efforts you can take daily that bring that bigger vision to life. But how do you actually make time to work toward those goals bit-by-bit? The answer lies in scheduling. Break down that bigger goal into small, consistent efforts and then schedule time every day to make it happen. And for this, I use a method that I call Calendar Blocking. This simple, yet effective system is essential to The Routine Guide that we create in Future You, my one-on-one coaching program where we take a look at your bigger goal and break it down into small, consistent efforts in your everyday routine. The foundation for scheduling this way is a calendar in which you "block off" time for each task on your to-do list. So first, it's important that you have a system that you like. 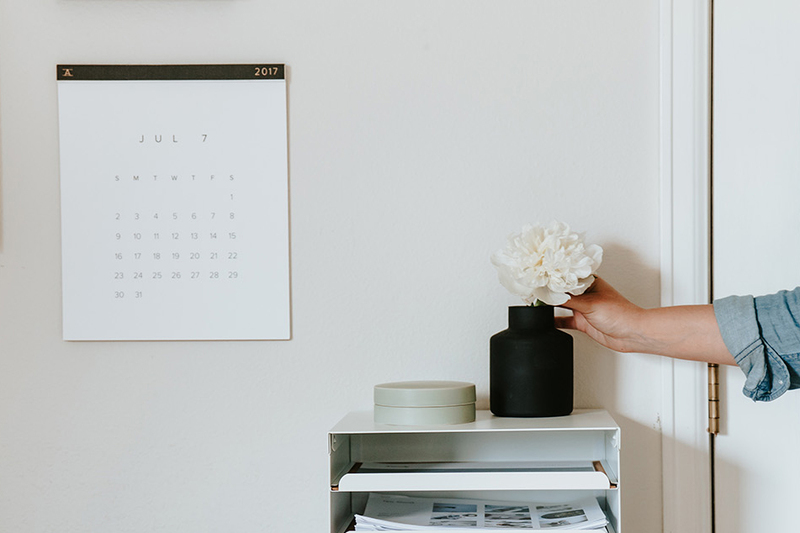 If you’re more of a digital gal, Google Calendar comes standard with GSuite and is a great option. I tend to prefer the design of Fantastical 2, a desktop app that I have synced with my Google Cal. But let’s not forget that pen and paper is sometimes the simplest and easiest method, so your favorite print-out or planner is great too! Find the one that works for you. I love lists. Truly, I do. But my problem with lists is that I often overestimate how much can be done in a day. That's where Calendar Blocking shines. As the name implies, each task on your list is given a block of time. Now, how specific you get is entirely up to you. For instance, I'll block off about an hour that I call "Morning Routine," rather than segmenting "shower, get dressed, breakfast." But if you're settling into a new schedule and carving out time to work toward those big goals (which you will be in the Future You program! ), you’ll want to be a bit more detailed. For client work, I'll block off the amount of time I think I'll need along with any associated design tasks. So on my calendar it reads "9:30-11: Client Name - Design Task." I even go as far as to block off Drive time and Workouts. By putting those things on my calendar, I'm getting a more accurate reflection of how much time is remaining. And if it's on my calendar, I'm more likely to stick to it. Any meetings or calls get blocked off as soon as they're scheduled. The most effective system is the one that feels true to you and the way you work, so take the time to really personalize it and make your own. Think about what is and isn’t working for you about scheduling in this way. Do you need to color code your blocks or does that rainbow effect feel overwhelming? Should non-negotiable MEETINGS appear in all-caps? Does it help to write the duration or location in the title of the block? Small changes like this can make the system even more effective for the way you work. As a visual person, I love that personalizing my system lets me see how busy I am at-a-glance. I even have different color blocks for work, play, and important appointments to further differentiate. It makes it easier to determine if I can take on that last minute project that came through my inbox or if I'm too swamped to even think about it. I'm pretty obsessive about tracking my time so that I never wonder "where the day went." But at the end of my day, I'll go back and make sure that my Calendar Blocking is a true reflection of how long things took. I find this practice makes me more conscious of how long things actually take vs. how long I thought it'd take. It's also a great way to have a sort of "business journal" to look back on. Any task that shifted and I didn't get to, I move to the next day. And that's a wrap. Now, If this system piques your interest even the slightest, I encourage you to test it out for a week and see how it goes. I have a feeling you'll be hooked. PS – Need help breaking down those big goals into small, consistent efforts you take daily? Future You is a one-on-one coaching program designed to help you do just that. Let’s create a beautiful vision for your everyday, and then design a plan to make it real, so you get what you want out of work AND life.